Unique and colorful this design will WOW the lucky recipient. 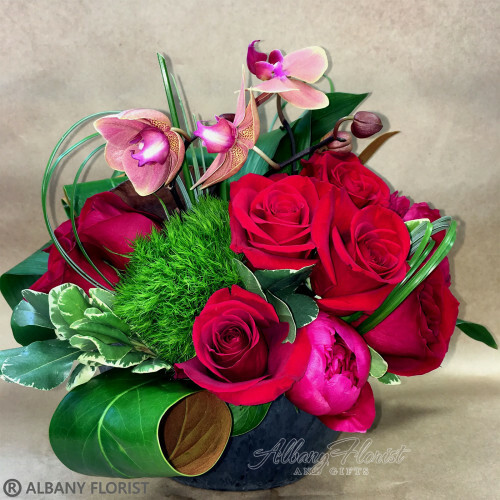 This design features green dianthus, roses, peonies and phalaenopsis orchids. Bouquet will be delivered approximately as pictured. Great choice! Do not miss it! substitutions of flowers or containers happen due to weather, seasonality and market conditions which may affect availability. If this is the case with the gift you've selected, the local florist will ensure that the style, theme and color scheme of your arrangement is preserved and will only substitute items of equal or higher value. Cut the bottom of your stems every other day about an inch. This helps your flowers get a fresh drink! Welcome to our flower shop. We are located at 823 San Pablo Ave, Albany, CA. We are a full service florist for all life's occasions including: birthdays, anniversaries, congratulations, Love and romance, new babies, weddings, graduations, proms, baby showers, events, engagements and holidays. We deliver to all the hospitals surrounding Albany and we also deliver sympathy arrangements to all the local Mortuaries and churches.